The Sustainable Northampton Plan will be reviewed on an annual basis utilizing a methodology that will be developed in the next 9 – 12 months. Traditional Neighborhood and Receiving Zone — These are currently the most developed areas with planned expansion of developable area to accommodate expected demand for new growth. 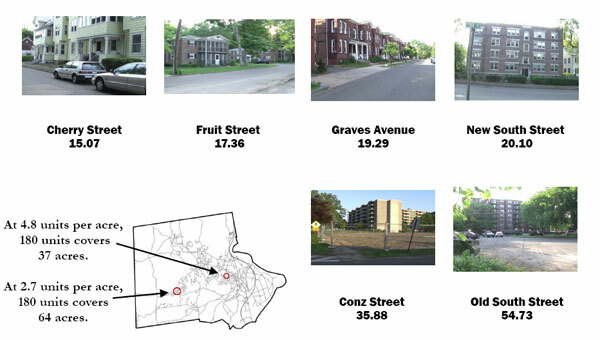 These areas can accommodate the vast majority of new smart growth residential development, but only with design standards to ensure that new development does not degrade the quality of existing neighborhoods and mitigates traffic. More focus on design details, encouraging designs compatible with historic neighborhoods, focus on pocket and linear parks and on the quality of life generally are key elements for encouraging a population density consistent with the highest quality neighborhoods present 50 years ago. There are opportunities to accept the development rights into these areas from Conservation Development areas. We are encouraged by language like “ensure that new development does not degrade the quality of existing neighborhoods and mitigates traffic” and “encouraging designs compatible with historic neighborhoods”. We are concerned, however, about the reference to densities of 50 years ago. Much has changed since then. In particular, women have far more jobs outside the home, meaning more cars are on the road. By the same token, more families have become too busy to dedicate an adult to shopping in small amounts on a daily basis. If you’re buying 50 pounds of groceries and supplies at a time, you’re probably going to prefer to do that by car rather than walk or use the bus. Factors like these mean that a neighborhood that had comfortable density in 1957 might be perceived as congested with cars today. Ask for creative designs and cluster developments that allow higher density to improve the yield of housing in the downtown and village centers. Use the downtown and more densely developed areas to build high and medium density housing (12 to 65 units/acre; see Density Study prepared by the Office of Planning and Development for illustrations). In our opinion, the example buildings at the two highest densities are troubling. They are neither handsome nor in keeping with the historic character of Northampton. It would have been best if these illustrations, and all the illustrations destined for the final Plan, had been prominently presented for the public’s review some time ago. This would have fostered a more full and fair discussion of the issues. The planning office tells us that the illustrated Plan will be released in January. The object of the charette [public design workshop] is not, however, to produce verbiage but to produce results on paper in the form of drawings and plans. This highlights an essential difference between zoning codes and traditional town planning based on civic art. Zoning codes are invariably twenty-seven-inch-high stacks of numbers and legalistic language that few people other than technical specialists understand. Because this is so, local zoning- and planning-board members frequently don’t understand their own zoning laws. Zoning has great advantages for specialists, namely lawyers and traffic engineers, in that they profit financially by being the arbiters of the regulations, or benefit professionally by being able to impose their special technical needs (say, for cars) over the needs of citizens — without the public’s being involved in their decisions. Traditional town planning produces pictorial codes that any normal citizen can comprehend. This is democratic and ethical as well as practical. It elevates the quality of the public discussion about development. People can see what they’re talking about. Such codes show a desired outcome at the same time that they depict formal specifications. They’re much more useful than the reams of balderdash found in zoning codes. Some…especially the young and the childless, are moving back to cities, and once again there are private developers ready to meet their desires, which now run toward lofts and historic town houses with modern kitchens. But for most middle-class families, the ideal of city life conflicts with the reality of their own lives. Even if they’re willing to do without a yard, how can they afford to live in a decent neighborhood within easy commute of their jobs? How will they go shopping on a rainy day with a child in tow?